"After its successful maiden flight in December last year, we are planning a ferry flight from its research base in Zhuhai to Jingmen, central China's Hubei Province, in July." China's first home-grown large amphibious aircraft AG600 makes a smooth landing after its maiden flight in Zhuhai, south China's Guangdong Province, on December 24, 2017. The China-developed AG600 large amphibious aircraft is expected to be delivered to customers by 2022, says manufacturer the Aviation Industry Corporation of China. "After its successful maiden flight in December last year, we are planning a ferry flight from its research base in Zhuhai to Jingmen, central China's Hubei Province, in July," said chief designer Huang Lingcai. "Then, it will prepare for its first takeoff from water, scheduled for later this year," said Huang, also chief engineer of the AVIC General Aircraft Research Institute. Its first takeoff from water will take place at a large reservoir in Jingmen. 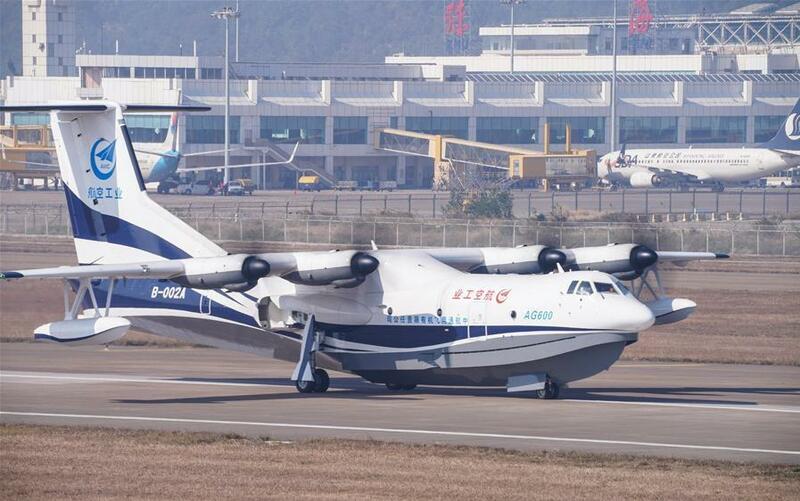 Designed to be the world's largest amphibious aircraft, the AG600 will be mainly used for maritime rescue, fighting forest fires and marine monitoring, according to state-owned aviation giant AVIC. Codenamed Kunlong, the AG600 is undergoing test flights in Zhuhai, a coastal city in south China's Guangdong Province. With a range of up to 4,500 kilometers, it is designed to be capable of takeoff and landing in 2-meter waves. "We are endeavoring to get the airworthiness certification from the civil aviation authorities by 2021, and deliver it to the customers by 2022," said Huang.